[The immigrant] community's interests and values were embodied in the Jewish immigrants' popular music, what Mark Slobin calls in Tenement Songs, Urbana, 1982, "the popular music of the Jewish immigrants." 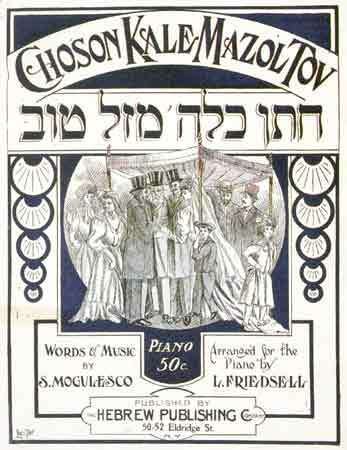 The title page illustrations of Yiddish sheet music, as well as the contents, are an as yet sparsely used prism through which to view the life of that community. Five of these popular songs, from the unmatched collection in the Library's Music Division, provide us a slice of that life. Illustrations for Leben Zol Amerika (Long Live America) are the American icons that the Jews held dear: George Washington, Abraham Lincoln, and the Statue of Liberty, Washington represented the "Land of the Free and the Home of the Brave"; Lincoln symbolized opportunity, in going from "Log Cabin to the White House," so why not aspire to go from tenement to mansion, from public school to university? The Statue of Liberty symbolized the welcome to all who had come and would yet come to America. 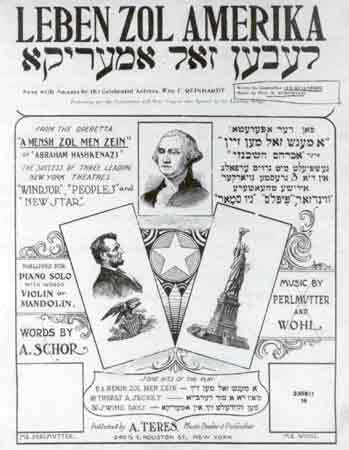 Featured on the title page of the sheet music of Leben Zol Amerika (Long Live America) are the three favored icons of the American Jewish immigrant sensibility, George Washington, Abraham Lincoln, and the Statue of Liberty. Leo Rosenberg and M. Rubinstein, Leben Zol Amerika (Long Live America). New York, n.d. Hebraic Section. Every Jew must express his loyalty to the Land of Freedom with all his being/Once settled he will surely appreciate a Land which gives him full and equal rights/ Yes! Yes!/ So become a citizen, take out the required papers/ Oy, Oy/ Become an in-law of Uncle Sam/ Cast your vote/ It gives you great power/ Then none can cause you hurt/ The world will esteem the Jew/ Defend the American Flag. Refrain: Praised and blessed be this Land ... etc. 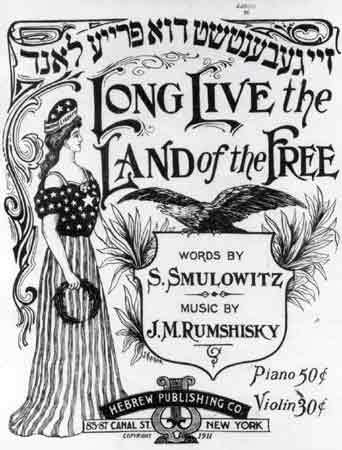 Solomon Smulewitz's words are no better in Yiddish than in English, but J. M. Rumshisky's music is much better, and better still is the title-page illustration by Joseph Keller, where the American eagle glares at Lady Liberty whose name is on her patriotic bonnet, which like the gown is decorated with stars and bars. in her hand she holds a laurel wreath. sacred duty of every Jew. Solomon Smulewitz (Small) and J.M. Rumshisky, Zei Gebensht Du Freie Land (Long Live the Land of the Free), New York, 1911, Music Division. The sinking of the "unsinkable" Titanic in 1912 was mourned in some two hundred American songs. 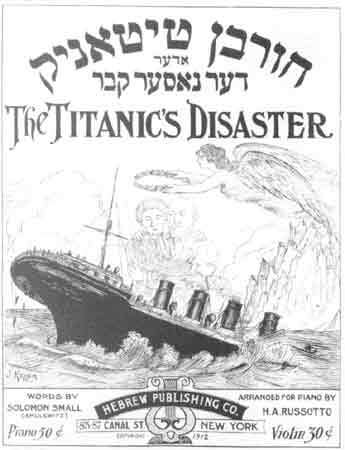 The Yiddish song Hurban Titanic, oder der Nasser Kever (The Wreck of the Titanic, or the Watery Grave) bears the English title The Titanic's Disaster The words are by Solomon Small (Smulewitz), the cover drawing by J. Keller. The ship has struck an iceberg and as it goes down people are climbing down on ropes from the ship to the sea. Above the stricken ship float the spirits of Isadore and Ida Straus. Isadore was one of the three brothers who made Macy's one of America's leading department stores. Each of the brothers carved out a career of distinguished public service. As Secretary of Commerce and Labor, Oscar Straus was the first Jew to serve in the Cabinet; Nathan was one of America's most enlightened philanthropists with a lifelong interest in public health. (The Israeli city of Netanyah is named for him, in appreciation of his having given two-thirds of his fortune to communal projects in Jewish Palestine.) Isadore, the great merchant, served as a congressman. The folk favorite was Ida, and the final stanza of the song (in translation by Mark Slobin) tells why. There stand, in woe/The thousands in need/And know that death/will dash them down/Then they cry, "Save yourselves/into the boats quickly, women/No man dare/ Take a place tbere. "/But listen to one woman-soul/who can say/,,i won't stir from the spot/I'll die here with my husband. "/Let small and great honor/the name of Ida Straus! Keller has drawn an angel placing a wreath on the heads of the loving couple who are joined in an embrace. The sinking of the super trans-Atlantic liner, the Titanic, was a tragedy that engulfed all of America. The Jewish community was particularly touched by the drowning of Ida Straus, who refused a place on a lifeboat reserved for women and children, choosing to share the fate of her husband, the beloved philanthropist, Nathan Straus. The drawing by J. Keller portrays an angel placing the wreath of immortality on their heads. Solomon Smulewitz (Small), Hurban Titanic (The Titanic's Disaster), New York, 1912. Hebraic Section. The musical number dates back to the 1890s. The carefully drawn figures remain lifeless; perspective and anatomical details are weak. Yet there is a strong attempt to convey an ethnic scene in all its richness. The bored children, officious men, fearful bride, the self conscious matrons are all identifiable types, as if taken from the Yiddish stage. Hardly a musical on the Yiddish stage was without a wedding scene. it made of the audience an extended family, joined in happy celebration, shedding shared tears of joy. Note the huppah (wedding canopy) held up by boys and girls, and the wedding garb of the celebrants and officiants, full dress and top hats. S. Mogulesco, Choson Kale Mazol Tov (Good Luck to the Bride and Groom), New York, 1909. Hebraic Section. The cover of A Boychik Up-To-Date (An Up-To-Date Dandy) is notable for its garish colors and its pudgy, faddishly clad, bejeweled "hero." The humor and satire make no pretense of subtlety. On the one hand is the knowledge by those who fashioned the song and issued the sheet music that many in the immigrant community would envy and take this modern American dandy as a model of someone "who has made it." On the other hand, it is not lost on them that there is much to decry in such tawdry Americanization, such vulgar acculturation. The "up-to-date dandy" is more a comical bumpkin than an elegant Edwardian gentleman. The garish colors of this sheet music's title page match the pudgy, faddish, bejeweled "hero." The song is critical of this up-to-date dandy and, through him, the American scene which created him. 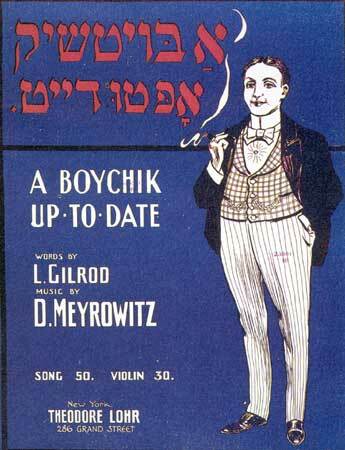 L. Gilrod and D. Meyrowitz, A Boychik Up-To-Date (An Up-to-Date Dandy), New York, n.d. Hebraic Section. The time is not distant when the Russian Jew will have solved the elementary problems of American existence.... They will soon reach the point at which they will turn for guidance to the history of the Germans and their Sephardic predecessors. Eschewing the foolish pride of both, they will emulate the dignity and selfrespect of the latter, and the sobriety and steadiness of purpose of the former. They will use the institutions created by them as the stock upon which to engraft their intenser fervor, their broader Jewish scholarship, a more enlightened conception of Jewish ideals, and a more inclusive interest in Jewish world questions.